Welcome to the web's best and easiest site to buy NFPA approved chemical labels. The National Fire Protection Association has strict regulations on labeling hazardous and toxic chemicals, and rightly so. Coming in direct contact with many of the chemicals below, can cause everything from nausea to fatalities. However, with a clear label properly adhered to the chemical's bottle, bin or beaker, accidents and death can be easily avoided. We offer the most durable paper and vinyl NFPA Chemical Labels on the market, and we offer them at the best prices, guaranteed. Can't find the specifc chemical in the Pre-printed NFPA Labels below? 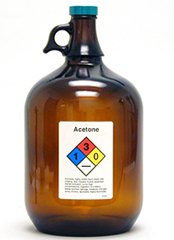 We also sell Custom NFPA Labels where you can enter the chemical name and specifications yourself. Please give us a call for more help. Using a pen or magic marker simply write on these highly durable NFPA labels to set your rating. It's good now stop asking for a review. Perfect for what they were intended for to stick on spray bottles, and that's it. I ordered the first labels to try in our process area. They worked great and our compliance auditors were very impressed. So much so that we are now moving to our second chemical. I foresee us using these labels for all of our secondary containers in the near future. The order was delivered quickly and the labels are great quality. Perfect size for labeling our chemical bottles! And the labels are made with high-quality adhesive so they should stay put. The labels were delivered as promised, and they look great.